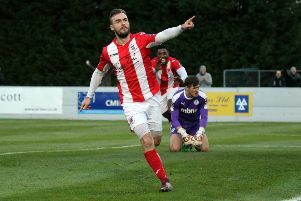 Draws are proving costly for Brackley Town in their pursuit of the Vanarama National League North pacesetters. Matt Lowe’s late equaliser earned Saints a point in Saturday’s -1-1 draw with lowly Blyth Spartans but it was another frustrating day for manager Kevin Wilkin. A poor first half in which neither side could muster any cohesion to their play at least ended with some excitement for the spectators. In added-time Sean, Reid’s cross flashed across goal in a warning to Saints while at the other end Blyth keeper Peter Jameson had to save well from Glenn Walker’s fine free-kick. The second half was altogether much improved. Reid put the visitors in front in the 68th minute with a header planted beyond Danny Lewis direct from Kieran Green’s corner. Lowe’s effort was wide and Glenn Walker’s deflected shot was saved and at the other end Dan Maguire’s shot hit the post. 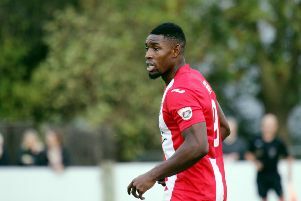 With time running out for Saints, Lee Ndlovu was put through on goal by Jimmy Armson’s measured pass but the striker only found the bar in a let-off for Blyth. Within a few moments however Saints were level when Lowe’s 83rd minute shot slotted past Jameson, neatly set up by Armson.